Manufacturer & Exporter of Stainless Steel 430 Round Bars & UNS S43000 Round Rods, SS 430 Bright Bars, Steel 430 Rods, 430 Hexagonal Bar Suppliers in India. 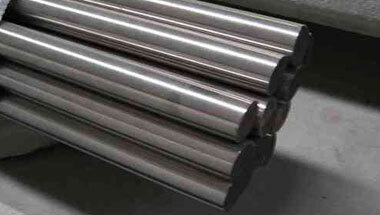 We manufacture & export SS 430 round bars made widely used across the industry. These 430 stainless steel Round bars are available in multitude of length, width and dimensions. Designed in compliance with international quality standards, they find numerous applications in the construction industry as well as other commercial applications where strength reinforcement is necessary and forms a vital part of the construction. Grade 430 is a ferritin, straight chromium, non-hard enable grade, combining good corrosion resistance and formability characteristics with useful mechanical properties. Its ability to resist nitric acid attack permits its use in specific chemical applications but automotive trim and appliance components represents its largest fields of application. We export this SS 430 Round Bar in various parts of the world at competitive prices. This SS 430 Round Bar is widely used in application in several industries such as sugar mills & distilleries, cement and construction industries, Textile Industry and Diary Industry Plants etc. Stainless Steel 430 Round Rods Manufacturer, SS 430 Forged Bar, Steel 430 Hex Bar, Stainless 430 Hollow Bar, DIN 1.4016 Black Bars Supplier in India. Morocco, Azerbaijan, Canada, Indonesia, Malaysia, Iraq, Ethiopa, Germany, Ghana, Israel, Angola, UAE, Peru, Kuwait, Trinidad and Tobago, Russia, Africa, Mozambique, Venezuela, Sudan, UK, London, Tunisia, Brazil, Italy, Chine, Cameroon, Argentina, Colombia, Thailand (Bangkok), Houston, Democratic Republic of the Congo, South Africa, Bahrain, Turkey, Vietnam, Iran, Saudi Arabia, Kazakhstan, Mexico, Nigeria, New Zealand, Egypt, United States, Sri Lanka, Australia, Jordan, Dubai, Uganda, Algeria. Kolwezi, Durban, Dar es Salaam, Maiduguri, Abidjan, Doha, Maputo, Ouagadougou, Mogadishu, Yaoundé, Luanda, Bulawayo, Tel Aviv, Cairo, Freetown, Soweto, Kaduna, Zaria, Bethlehem, Kinshasa, Dakar, Data from the UN, Brazzaville, Alexandria, Cape Town, Algiers, Mbuji-Mayi, Johannesburg, Dammam, Byblos, Subra al-Haymah, Antananarivo, Manama, Bamako, Port Elizabeth, Aqaba, Amman, Lusaka, Istanbul, Mecca, Sharm el-Sheikh, Muscat, New York, Kano, Khartoum, Colombo, Tehran, Omdurman, Fez, Hong Kong, Jeddah, Cairo, Casablanca, Nairobi, Giza, Lubumbashi, Douala, Dubai, Singapore, Port Harcourt, Addis Ababa, Kampala, Accra, Abu Dhabi, Harare, Benin, Conakry, Beirut, Tripoli, Ibadan, Riyadh, Pretoria, Lagos, Jerusalem, Rabat.